No-Bake Honey Cake - Let the Baking Begin! This No-Bake Honey Cake is a simple no bake dessert with graham cracker cake layers and a soft cream in between, then topped with a sweet Chocolate Ganache. 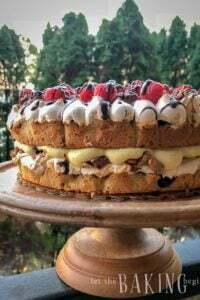 This Honey Cake is a quick dessert recipe and a great no-bake alternative for the original Honey Cake recipe. PIN this No-Bake Dessert recipe to your Dessert board!! This No Bake Dessert is the answer to all your baking problems! Are you not much of a baker? Does something go wrong every time you put something in the oven? Then this No-Bake Honey Cake is for you! This is a delicious alternative to the original Honey Cake, which requires you to make the cake layers from scratch. It still produces a tender cake that melts in your mouth, without the hours of intensive labor of making each individual cake layer. This Graham Crackers Cake is the perfect alternative! I love the original Honey Cake, but the time needed to make it is the time that I don’t have! I just had to make an easier no-bake version of the cake. So, I went about to make a No-Bake Honey Cake. Without the use of my oven, rolling-pin, or the hours of time. How did I accomplish such a thing, you ask? Graham Crackers. This might not be such a novel idea, but it works and works great! I used Honey Graham Crackers for cake layers. They absorb the moisture from the cream and become tenderly soft. So if you got some stacking skills, you’ll do great! Chocolate Banana No Bake Custard Cake: Another no-bake dessert to enjoy. Marble Volcano Cake: An eruption of flavors in just one cake! Black Forest Cake: Chocolate cake with sweet cream layers and cherries, YUMM! This No-Bake Honey Cake is a simple no bake dessert with graham cracker cake layers, and a soft cream in between, then topped with a sweet Chocolate Ganache. Heat cream until almost boiling (in the microwave or on the stovetop). Add chocolate and let sit undisturbed for 2-3 minutes. Using a spoon, stir until smooth. Whip butter until fluffy, add cream cheese 1 tablespoon at a time until no chunks of cream cheese are visible. While still whipping, pour the condensed milk, until fully incorporated. Transfer to a large bowl. In the now empty bowl of the mixer, whip heavy cream until stiff peaks. Add heavy cream into the condensed milk cream in 3 additions and carefully fold it in. Put a dab of frosting across the serving plate. Put the first row of 4 crackers. Press to secure them to the plate. Put about 1 cups frosting on top of the crackers and spread out evenly. Keep alternating layers until all frosting and crackers are used up. Cover the cake in remaining frosting. Crush up about 4 crackers into crumbs. 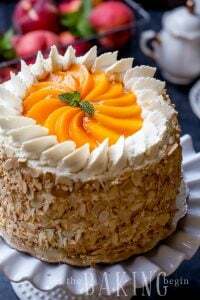 Take a palm full of crumbs, then cupping your hand press against the side of the cake. Pour ganache on top of the cake and spread out, being careful not to allow for dripping over the sides. Allow the cake to sit in the fridge for 24 hours before eating. In the first part of the recipe, you have chopped chocolate listed with the heavy cream, cream cheese, etc, but what is the chopped chocolate for or at what stage is it added to the buttercream and is the chocolate semi-sweet? The first part of the recipe is the instructions for making chocolate drizzle (ganache), and it has no cream cheese. You will use this chocolate drizzle to pour over the cake at the end. The cream cheese is whipped in the following part of the recipe for the cream. Love ALL your recipes on the site. Im super excited to make this for my husbands side of the family for Christmas. 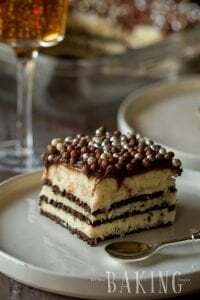 Im from Ukraine but my husband is 100% Canadian so their family is used to the one layer slab cakes with too sweet fristing :(((( have you ever tried this with de leche? We can get it already made in the same cans as the condensed milk. Thanks! Marina, the cake turned out great. Nobody could believe that it wasn’t baked. I used Trader joe’s organic sour cream for frosting, it started tripling in size after 15 min of mixing with sugar all the way during mixing. I poured bit of honey on each layer. Added toasted crushed walnuts in between and on the sides. Ganache on top. Simple, tasty and no mess. Great feedback Tamara! So happy everything worked out and you enjoyed it! Marina, you are such a generous lady to share all these great ideas. I came from Ukraine as well, so I feel like I found a great friend who shares her passion for what I love. 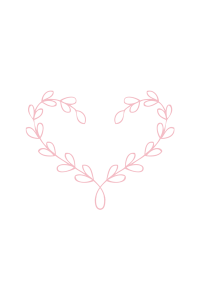 I like sharing the love, ha! Hope you found the menu where you can search stuff by categories, makes it really easy. Enjoy the recipes Tamara, and let me know how everything goes! have made this cake several times, it is delicious. How much cream cheese is in a “packet” where you are, please? A packet of cream cheese is 8 ounces. Thanks for posting this recipe; it sounds super yummy! Doesn’t sweetened condensed milk come in two different sizes at the grocery store? If so, the small or large can? No problem Monique! I have never seen anything but a 14 oz can. I think you’re thinking of evaporated milk, that one comes in a larger can. Is it just me, or is it humorously odd that there’s no honey in honey cake?????? IS there anyway to correct the recipe and put sweetened condensed milk. 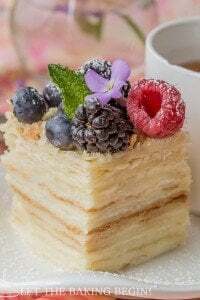 I have just made it for a party tomorrow and I was thinking it was not going to be sweet so I came looking to see if I messed up but I didn’t the recipe is wrong. I will change the recipe to clarify that it’s sweetened condensed milk. Where I am from, condensed milk is not the same as evaporated milk and condensed milk is synonymous with sweetened condensed milk. I apologize for misunderstanding. How long can it be stored for ? In fridge. Will ot it get too soggy? For a couple days for sure. The crackers are supposed to absorb the moisture from the cream, so when the cake sits in the fridge it becomes soft, but definitely not soggy. Does the recipe call for **sweetened** condensed milk or just condensed milk? Thanks for the cake which I am planning to make for my husband’s birthday. I am not sure how many crackers need to be put on the first layer? It’s up to you, but I placed 3 whole crackers and half of the fourth one, making it one long cake. Another time I just did 3 crackers… It all depends on how you like it. Just take the amount needed for the cake and play with them (before frosting), and find the best way to fit them on the serving platter. This amount of ingredients does not make too big of a cake so if it’s for a birthday party, I would double or triple the amount. Marina, thank you much for reply! It won’t be a big party. We just invited 2 families at our home. I will follow your instructions from your reply. It can be either chilled or room temperature, but with chilled cream cheese, the cream will not run as much and hold shape better. Hi! what do you use for chocolate? like semisweet chocolate chips or just baking chocolate bar? For ganache I use good quality chocolate chips (dark chocolate) or chocolate bar. I like Trader Joe’s 1 lb choolate bars, they are 4.99 /lb and are good quality. you just chop them finely and pour the cream on top. love this cake. So easy and delicious. Been making it for many years. but just with different cream(conde.milk=butter) and didn’t top with ganache. it taste like medovik but quick version of it. btw… love your website. 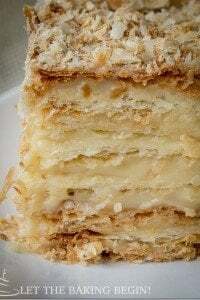 What an interesting, simplified variation of Russian honey cake. Love it! Pinning. also, i love your spoons!!!! they looks super.